I Need an Easy Ground Cover! A hardy, rapidly growing, maintenance-free, reasonably drought tolerant, evergreen ground cover with attractive leaves and lovely flowers -- is there such a plant? Yes, there are a few, but one is no longer recommended! Myoporum pacificum is a member of a family (Myoplraceae) widely planted in residential and commercial landscapes and along many miles of California highway hillsides for erosion control. Native to Australia and New Zealand, this attractive and popular family of plants has been virtually pest free. Since 2005, however, a new and exotic genus of thrips (Klambothrips) and its single species (Klambothrips myopori Mound and Morris) has been moving its way north along the coast from San Diego County and has recently appeared here in SLO County. Less than 120th of an inch in length, the adult black-bodied Myoporum thrips and its orangish hued larvae cause severe damage, particularly to new growth which they prefer. The female thrips inserts eggs into the leaf where the larvae feed, eventually causing terminal gall and severe swelling, curling and leaf distortion. Managing Myoporum Thrips is difficult. They have no known predator in California. Their tiny size, hidden feeding behavior, mobility and protected egg and pupal stages make most insecticides available to the home gardener ineffective. Pesticides available through licensed pesticide applicators have shown limited control of the thrips. Pruning out the diseased foliage and destroying (not composting) is effective but impractical for landscape plantings. Severely infested plants may have to be removed and destroyed. 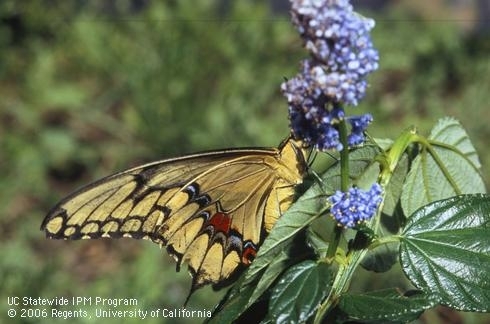 Fortunately, there is a native alternative to be found in the Ceanothus (California Lilac) family. 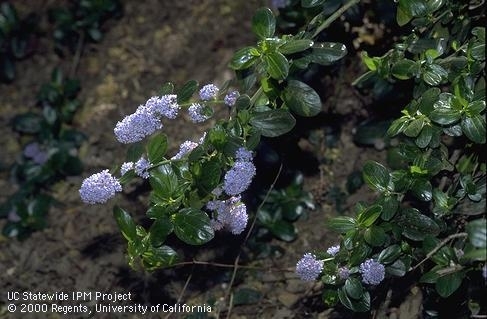 Among the many Ceanothus species, try one that is native to the Central Coast called Carmel Creeper (Ceanothus griseus horizontalis) for a dense, dark green groundcover with long, abundant sky blue flowers and no Myoporum thrips. Are all varieties of myoporum susceptible to the thrips mentioned in this article? 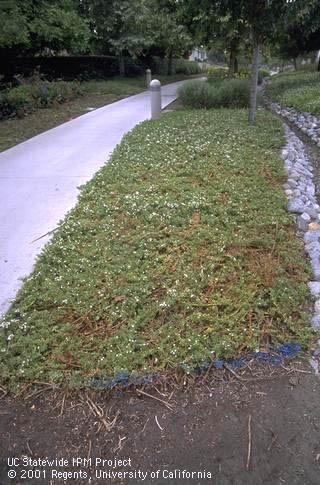 We are considering use of myoporum Parvifolium, or Putah Creek on a slope in south central Orange County CA. Would appreciate your thoughts! Both UC IPM and San Marcos Growers have some good info on Myoporum thrips and the susceptible host species. It apprears, at the time of the writing, Putah Creek had not been damaged by these thrips. You might also check in with the Orange County Master Gardener Program. They'll likely have first hand knowledge and experience specific to your region. Here is a link to their website where you can email your question or fill out an online form with your question and a Master Gardener will contact you.